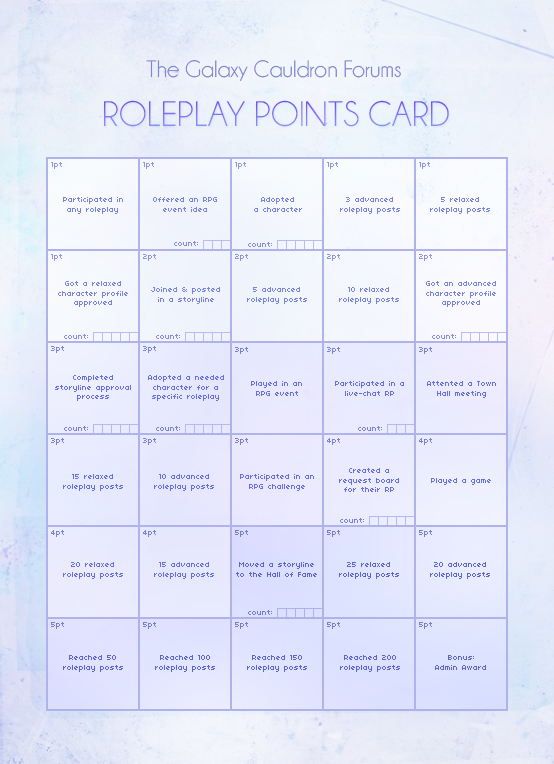 The GCRP Presents: The Roleplay Points Card! °The Roleplay Points Card is a way for our roleplayers to keep score of their activity in the roleplaying section of the forum! Each block contains an activity (called a "milestone") that is worth a certain amount of points for completion/participation. Players keep track of their activities using this card and tally up their score at the end of the month! °Oh, it's really not complicated at all! Just copy this image into an image editing program (I use Paint! XD) and as you reach a milestone on the card, cross off that block! (try keeping the point values visible). Then, at the end of the month, a new board will appear for you to post your card and your final score! :bunnypokerface Why are there smaller boxes inside of bigger boxes? °Some activities can be repeated within a month to earn more points! For example, find the "Moved a Storyline to the Hall of Fame" box (second to last row, in the middle). It has five little boxes in it. What this means is that within the span of a month, if you finish 3 stories and they move to the hall of fame, you get 3x5 = 15 points! Whereas a single-block milestone, such as the "Played a Game" square (far right of the 3rd to last row) can only be obtained once a month. Example: you play Clue, you get 4 points! But if in the same month, you play Clue and Hunger Games, you only get the 4 points your earned for the first game. :bunnykonataeye Ohoh, so we're solely responsible for keeping up with our points? °Yes! ... and no. XD Our RP Moderator, Anaitlovesall, keeps track of posts made in different RP's so we'll do a quick eyeball check to make sure people are keeping honest, but for most things? Yes, you're in charge of tallying your own points. What do we get at the end of the month? °At the end of the month, once you've tallied all your points, those points will automatically turn into GC Activity Points (yaaaay)! But wait, there's more! We have special things you earn based on how many points you've acquired for the month. 20 advanced rp posts this is total for the month; if you got over 20, you get the 20 square, and the 15 square, and 10 square, and etc.! Played a RP game RP Games will be posted in the reporting thread for the cards that month! Adopting a needed character for a specific role play From our Adoptions center! Participated in an RPG Challenge Challenges are announced in the Welcome forum! Played in an event Events for the month will be linked in the report thread! Adopting a character From our adoptions area! Otaku's-R-Us! Offered an RPG Event Idea From our board in the welcome area! If you have any questions/comments about the Roleplay Points Card, Post 'em here! Otherwise, start collecting for the month of April! Note: Posts made in Games, Events, and Live RP's do not count towards the monthly post goal, as they are not considered 'Relaxed' or 'Advanced'. The ongoing game of Clue! counts for the "4pt Played a Game" square for this month - all original players are welcome to claim that square already! Don't forget to keep up with your Points Card as the month wares on!